Find open parking spots with 95% accuracy. What they do: Parknav turns location data from tens of millions of cellphones into actionable insights about how people move through cities. Their first product is an app that predicts which streets have parking available with up to 95% accuracy, and they already make money. Why it's a big deal: Accurate data on how people move through cities is invaluable. Retailers use it to site new locations, and drivers want real time data on open parking spots. Parknav uses their machine learning expertise to create the best real time location data available. They’ve started by solving a problem that 50M drivers have every night in US cities. Finding street parking. Their predictions are so accurate that their current customers include service fleets, navigation companies, real estate brokers, and automobile manufacturers. Parknav is working with Telecom companies to mine location data from tens of millions of devices - giving them enough information to accurately predict parking availability across all cities in Germany and the US. 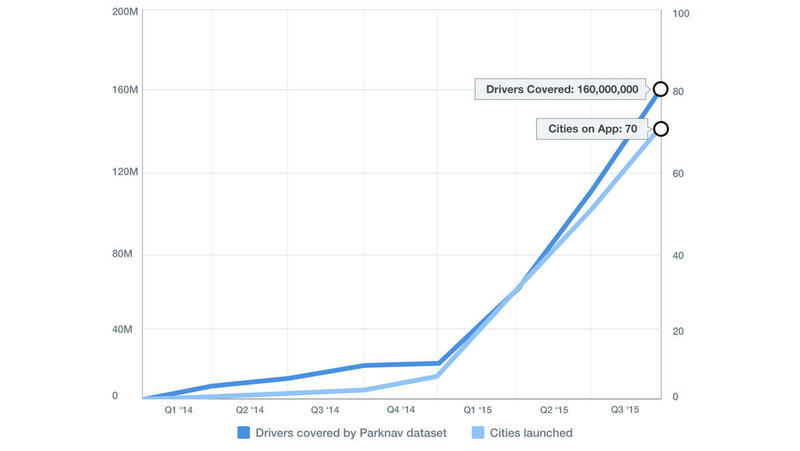 This isn't just the first accurate parking app, Parknav is laying the foundation to own the first and largest data set of human demographic movement ever. 1 BMW will supply Parknav's real-time street parking insights to all 1.5 million BMWs sold worldwide each year. 2 4 times out of 5 accurately finds available parking. 3 70 cities and two countries covered by the b2b service. 4 Amassing the largest human location data set in the world. 5 Parknav charges auto companies $9 per new car / year. 6 Content partners will soon launch Parknav to 100M users. Doctorate from Stanford and best PhD Award. Prof. at Univ. of Illinois. Named “Top Ten to Watch in AI”. National Science Found. CAREER Award winner. Winner of Chicago 2015 Android Hackathon. Speaks 4 languages. Built big-data systems for UBS and Chicago Mercantile Exchange. 10 yrs dev. experience. Despite all the location data made available from cell phones and other smart devices, no one has been able to figure out how to use that data to better understand how humans move through space. 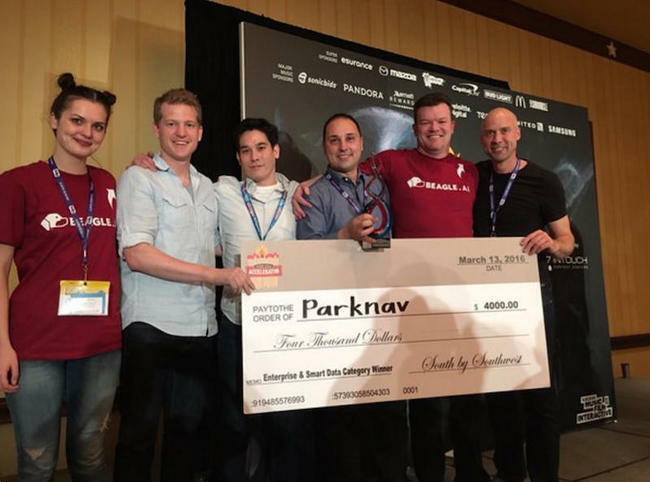 Parknav has assembled an award winning team of data scientists to turn location information into actionable data. They’ve started with parking. Using machine learning algorithms they are able to detect up to 95% accuracy if parking is available on any street in over 70 cities in the US and Germany. That’s incredible. To solve a technical challenge like this you need an exceptional team, and Parknav has it. Dr. Eyal Amir has a PhD from Stanford, is a CAREER award recipient from the National Science Foundation and has been named one of the “Top Ten to Watch” in artificial intelligence. His partner Sergei has won numerous hackathons, built security systems for UBS and the Chicago Mercantile Exchange and has over 10 years in development experience. Instead of taking the riskier path of focusing on a consumer app that won’t be able to monetize for years, Parknav is already making money. Their consumer app is just a prototype, they are already selling the parking data itself to several auto manufacturers across the US and Europe (at $9 per car per year) for use with their in-car GPS navigation. One of the largest real estate listing sites is also buying Parknav data to show potential home buyers how much on street parking is available in the neighborhoods they are considering. They’ve demonstrated an ability to solve 3 challenging problems. Getting access to extremely sensitive cell phone data from Telecom companies, assembling a team that can make that data actionable, and figuring out how to sell it to enterprise companies. There is so much more they can do with this data beyond parking. In addition to real estate, Parknav will have the best data set available for retailers to decide where to site their next location, for cities to better plan the built environment, and numerous other applications they are keeping warm on the back burner. Big data will be the source of how everything we do in life is made more efficient, and Parknav has the right start to be at the center of that revolution. It is the only solution in the parking sector we know of… [Parknav] covers complete regions and is not limited to parking lots or individual shared parking spaces and which is truly scalable for whole countries. These guys are like the Google of searching for a parking space - they always seem to have the right results, and with much less time spent driving in circles. Microsoft's home-automation Accelerator. Startups accepted to the program will gain access to top business mentors. Microsoft Ventures is a startup initiative designed to attract & nurture top entrepreneurs through its accelerator program. World's leading auth. on places, their competitiveness, and productivity, combining innovation, creativity, entrepreneurism as trusted strategist. Scout24 bundles leading digital marketplaces for cars and real estate under one name. Munich, Germany. Watch Eyal Amir discuss Parknav with Microsoft Ventures. Also see the full 45 minute interview we conducted with Eyal last week. We cover everything from the science behind Parknav, the grand vision, and how they got started. Parknav has spent 18 months signing telecom partners to provide location data for their artificial intelligence. With both Germany and the US now entirely covered they’ve launched the app in 70 cities. Now they’re laser focused on partnerships to serve Parknav to hundreds of millions of users starting in Q4. Parknav has amassed the largest location dataset in the world. The Parknav database continues to grow. They’re using the app as a proof of concept to acquire large OEMs, manufacturers, and software giants. Parknav has relationships with major software players that have over 100M monthly users. This idea has been around for a while with no success. What’s your advantage? We’ve all wanted technology to tell us exactly where to park for a long time now. But the challenge has always been obtaining real-time data on available parking. I’m a data scientist. I received my PhD from Stanford in artificial intelligence and then became a professor at the University of Illinois working on both AI and machine learning. While in Illinois I realized that while others have tried and failed to solve this problem for 15 years, they only ever approached the issue from one angle. For Parknav we chose to use data from as many sources as possible. We source data from our own users, other drivers, navigation companies, and telecom companies then analyze it via our custom algorithm. What we do is essentially connect many more dots than have ever been connected and spit out a highly accurate probability of parking availability. What drew you to parking as a problem? Some friends often ask me: “Why don’t you solve cancer? Why parking?” The truth is that I really love parking. I do it everyday, and I wanted to solve a problem that touches everyone all the time. But it’s merely a jumping off point to other problems that can be solved with the technology we’re building. When we have enough data we are accurate 85% to 95% of the time. In the worst data locations we can only get 70% accuracy. On average, we can predict whether or not there is parking with 80% accuracy anywhere in the city. The difference is really our ability to scale; we can easily cover every street in a new city 24 hours a day 7 days a week. Can you break down the economics? Who’s buying from Parknav? Who’s supplying the data? How does it all work? First, we’re an app that consumers, or regular drivers, use to find parking spots around their homes. But the real revenue drivers are automotive manufacturers, navigation companies and service businesses like the telephone and cable companies. Companies such as navigation and automobile manufacturers take our data and embed it into their systems for consumers. While service companies (known as fleets) like Comcast and AT&T have thousands of cars searching for parking all day that can save hours for employees with Parknav. The supply side of the business consists of navigation and telecom companies that provide the data we need for our algorithms. These industries both track all sorts of moving dots around the globe like trucks, cars, and people. Often the data is just a moving pin with little more information than location, but many of the dots correspond to parked vehicles (both illegally and legally parked). We aggregate as many sources as possible for an accurate reading on where all the cars and trucks are at any given moment. Demand depends on data accuracy. How much of the necessary data have you been able to get? We started with some luck – a child company of Deutsche Telecom invested in Parknav and connected us to some of the world’s most trusted data suppliers. Intros to the right people at the right time gave us the perfect start and enabled us to deals without being taken advantage of as the new guy. We’ll continue to acquire data suppliers but already have enough numbers to serve all of the US and Germany with 85% accuracy. You’re focused on b2b sales for automotive companies. How does the consumer facing app fit in? The consumer app is a great way for us to test the product and hone our data analysis. We have an app for both Android and iPhone that are still pretty clunky but already have 100,000 users in just two cities with another 18 cities just launched. Our focus is almost exclusively on the B2B business because of the larger revenue, data access, and distribution opportunity. Why did you launch the app in only two cities? Our initial customers took issue with us giving away Parknav free via the app, so we were slow to launch. They weren’t sure anyone would pay extra for a service they could find free on their phones. They’ve since realized that consumers are happy to pay for the extra convenience of parking navigation built into their cars. What are the barriers to entry for other companies? Our ability to stay ahead of the competition depends entirely on the quality of our data. We collect data from more sources than anyone else in the business and have a team of excellent data scientists which are exceedingly difficult to find these days and even more expensive. Companies like Google could allocate their data science teams to problems like this, and they might, but there are only a couple of companies in the world with talent like we have. To date everyone who has tried to solve parking has failed, while we’ve succeeded. That is our biggest advantage. How will you ensure your lead remains? The business with the best data set will win – there is a huge network effect. Every new dataset, every integration, the more people using the app, all of this adds up to a better dataset and in turn a much better product that will be difficult, if not impossible, to replicate. All of our competitors are also potential customers. Many of them, like navigation companies, have the right data access but not the right people to build the algorithms necessary to make sense of it all. Large companies: Inrix, HERE, TomTom, Google – these companies show desire to duplicate our product, and have access to data that could presumably be used to create our product. So far they've tried and failed. Medium companies: Paybyphone, IPS – have meter-payment data that could be used to create a limited version of our product. What they have so far is a significantly inferior product. Why is your team so great? Who are you guys? We have an amazing group of individuals working on Parknav. I was a Stanford PhD and have 20 years of experience in data science including ten years as a professor at the University of Illinois. My cofounder runs all development for Parknav. I’ll never understand how he can work so quickly. Gerhard has many years of business development experience with Siemens and his own companies, while Jeremy is an MBA from UI who does all our product and marketing. We also have two other data scientists that I hired from my classrooms at the University. Luckily both Sergei and I are experienced data scientists which has helped attract great talent, but we are definitely in the market for another senior scientist to round out the team. How has B2B business development gone? Tell us more about the OEM sales cycle. Unfortunately, I can’t mention any official partnerships yet, but we have a number of excellent clients in both the OEM and real estate space. When we got started three years ago the sales cycle was years long, but as the industry wakes up to what we're doing, they’re ready to buy. Now once we send out a quote, it’s a five month cycle and we expect to close many deals in late 2015 and early 2016. Why the wait? Why are you only now closing deals after three years? First, we had to prove our technology with proof of concepts in smaller markets with smaller customers. We started in Chicago focused on consumers before realizing the automotive OEM space was a much more lucrative opportunity. Then it was a matter of proving our technology with smaller fleets and consumers; we measured adoption and monetization and then shifted focus to work with the largest manufacturers who need coverage for the entire country. It took us some time to build the data coverage for both the U.S. and Germany but now we can show the largest OEMs proof of concepts that actually cover entire nations and get them really excited. What happens to your revenue as these deals close over the next six months? We have a number of large deals with automobile manufacturers, fleet companies, software companies, and real estate listing sites either closed or almost closed. As soon as our partners are ready for a press release we can make these more public, but by February we expect to have our first two customers completely on board with another five set to launch a few months later. Our average deal is $1M to $5M on three to five year contracts for each OEM. How big can the automotive market be for you? Every year about 66 to 70 millions cars are sold globally, more of which are integrating GPS all the time (33 million last year). Over half of those are in metropolitan areas, which means our initial addressable market is approximately 15 million new cars each year at ~$9 annual subscription. How does this evolve? Will Parknav become a staple in driving like GPS has over the last 15 years? There was a time when GPS was a nice-to-have in cars and now most people can’t drive without it. In five to ten years Parknav will be just as ubiquitous. It seems obvious, why not have your car just steer you to the spot nearest your front door, or the restaurant, or the baseball game? We just haven’t had the technology until now, and it will take several years to integrate with huge automobile companies. What’s the longer term vision for this data? Parking is just the entry point to the market and an initial revenue stream. We need to lock in all the data we possibly can to get ahead of the competition which we’ll soon mine for additional intelligence. With our data set, not only will we know where to park, we’ll know how people are moving, where crowds are forming, where Starbucks should open their next location, etc. We’ll be an unprecedented source of data on everything the populous does and there are numerous ways to monetize that. What are some other markets outside navigation? There are many types of customers that could integrate smart parking in the future including real estate and other consumer apps such as Yelp and Groupon. Real estate companies can quickly show their potential buyers all the parking around a given property in real-time. Yelp would work well with Parknav: imagine if your dining recommendations came with live parking data? Also proximity deals are a possibility for us. Our app will know where you’re parking and be able to feed nearby deals from the Groupons of the world. When parking does run out in a given area, the app will be able to surface deals from local parking garages. Can you talk more about the real estate opportunity? Real estate companies use Parknav to showcase how much parking is available nearby a given property listing. Agents pay us to use the software and then sign up all their potential buyers as Parknav users. They basically pay us to find customers for Parknav. What are the hardest problems you’ve had to solve? We face all sorts of problems: data problems, traditional startup problems, employee engagement and interest, etc. We’re a small fish in a huge industry and getting the attention of the right clients has been one of the hardest challenges. Figuring out how to sell to larger corporations, how enterprise sales relationships work and evolve, and how to leverage what little advantage we have has been tough. The two biggest challenges that will remain are building the best dataset and technology while simultaneously convincing large OEMs that what we’re doing is inevitable. We’ve done both well so far, but the industry is ever-evolving and nobody really knows how cars will navigate in the future. We need to remain in the lead, continue to innovate the technology and find industry leading partners to work with us. Parknav is conducting a Regulation D offering via Wefunder Advisors LLC. CRD Number: #167803. Parknav is an on-street parking solution, using data and predictive analytics. Today, the company has 100,000 users in Chicago and San Francisco, with another 20,000 in Germany. The seven-person team, which received undisclosed seed funding from German incubator You is Now, is raising $2.5 million to expand. Parknav can help you find free, metered, and permit street parking in Chicago. There is both an Android and iPhone app! PARKNAV saves drivers time when looking for parking by providing them with an optimized search route to find open free, metered, or permit parking in Chicago, San Francisco, Munich, and Hanover. For drivers in places like L.A., Chicago, San Francisco and New York, finding a parking spot can be a huge headache. But what if there were an app that told you where to find an open parking spot, and gave you turn-by-turn directions to that space? That’s what ParkNav aims to do. Parknav presented an easy to use and free app during the Connected World Conference at the Chicago Auto Show. Thanks for vouching for Eyal! If you'd like to invest in Eyal, please open an account. We'll waive your fees if you do it now. We asked Eyal for 10 personal references. Can you vouch for Eyal?